“Sigue empujando Chava!” Keep pushing, she yells at her cousin, Chava. Having snuck into the neighbor’s yard, they had taken two juicy watermelons by rolling and pushing them along. The neighbor spots them and yells. They run as fast as their 6-year- old legs will take them. Neighbor says: ” Van a ver cabrones me los voy a chingar cuando los agare.” I’m gonna kick your butts when I catch you. Gloria stops and yells back ,”A mi nadien me puede tocar soy hija de Salvador Flores.” No one can touch me I’m the daughter of. A few days after that incident that same neighbor comes by the house with some watermelons and laughs hard as he tells Salvador what his daughter said and observes “esa tiene que ser tuya con esos huevos.” That one has to be yours with all that fearlessness. My grandfather, Salvador Flores Huerta, was a very complicated man. By the time he became a father to my mom, he had been a bounty hunter, a lady’s man and a hustler. His mom, Sabina, was loving and believed in the power of the land, while his father , Demecio, was mean and violent. From these two extremes, Salvador poured all the love he could into Gloria-his only child. My grandmother Maria Vasquez Torres, on the other hand led a very traumatic life. Orphaned at 10 years old, she was sent by her grandmother , Matilde, to go take care of her pregnant sister. The sister passed during childbirth yet nobody sent for Maria so she remained in the home of a much older man who violated her. She was 12 years old when she got pregnant the first time and birthed five kids with him. When she met Salvador in her early 20’s, she left all the kids behind and probably hoped her life would improve. She had very little love to give my mom. And in retrospect, my mom agrees that my grandmother probably resented the one daughter she did raise because Salvador was loving to Gloria, not so much to Maria. Gloria knew from the start what was up. The day Pedro Infante, the icon of Mexican cinema, died, my mom, all of 4 years old, serenaded the adults who were sad at his passing. She sang “La Calendria” con todo gusto/with much joy. Years later when her small belly wasn’t filled by the meager food at her table, which was often, she would search out food by following her nose. She would come up to a neighbor’s house, offer to do some task that was helpful and was offered a place at their table. Usually it was meat-her favorite-which she ate with gratitude. She knew her parents were never going to stop moving from ranch to ranch (her dad’s past prevented that), never going to stop fighting with one another, and knew her mom would never leave her dad. For as much as she adored her dad, on some level there was an awareness that it wasn’t love that kept them together. 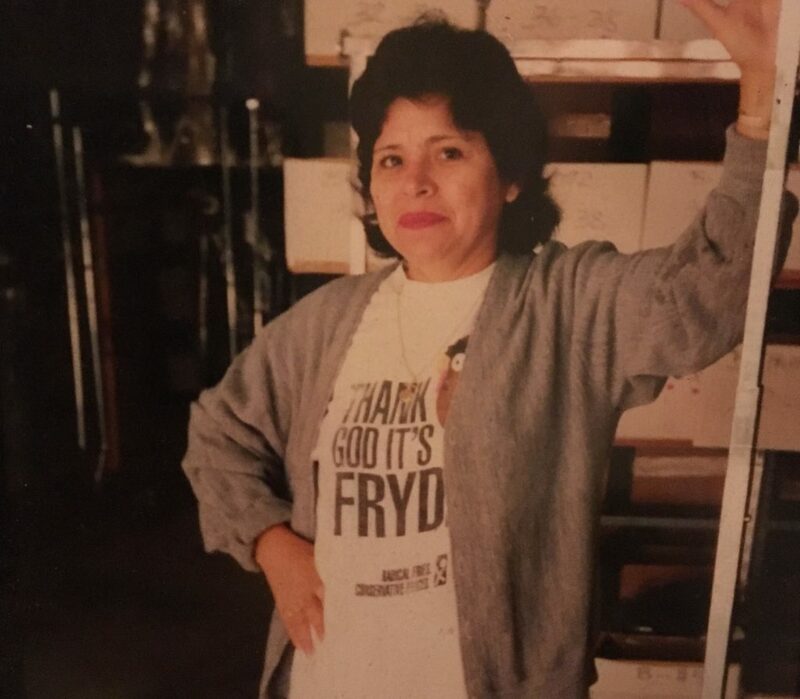 So at 11 years old, when Tia Chello Sanchez offered her a stable home, meaning no more moving around, an opportunity to go to school and learn some skills to earn some money-Gloria leaped away from one life and began another one. Gloria learned to read and write, excelled at it, considering her late start. She helped Tia Chello wash and iron clothes among other helpful tasks for money. She had friends, would go to the movies whenever possible, learned to dance balet folklorico and was empowered to value herself above all else especially because she was a mujer/female. On more than one occasion, Gloria watched Tia Chello defend a woman from her physically- abusive husband. Chello had a special belt with nails on it for those times. Having narrowly escaped her own abusive forced marriage, Chello refused to ignore what was going on in her community. Chello would get threatened by the abusive men and on one occasion the mother of one of them-she was told to mind her own business. She always retorted, “Eso no es de hombres. Pegandole a una mujer, eso es cosa de cobardes.” That ain’t about being a man. Hitting a woman is what cowards do. Years later, when my mom found herself at 16 years old in an abusive marriage, she asked her dad for help and when support didn’t come, she stayed. I must state that my dad Antonio Contreras Aguilar was raised by loving and hardworking parents. They were dairy farmers and led very full lives. They exposed their kids to live music, dancing and a love of land. Juan Contreras Ruiz and Antonia Aguilar Bustos were the epitomy of content human beings. I believe when my dad left Michoacan and the land it broke him and we all paid for that disconnection. He wanted to possess my mom as a way of controlling something. Gloria refused to be possessed for obvious reasons. As a young bride she was told not to wear short dresses-she wore them anyway. Never learned to ride a bike cause her dad thought it unseemly. Told not to wear red or yellow cause those are trampy colors. And my dad refused to let her drive. At 22 years old when she (im)migrated, she began working and having her own nest egg. Although unable to drive, my mom made sure we got around. That we experienced our culture through live music and watching old movies from Mexico. Maria Felix, Lucha Reyes, Lola Beltran and Amalia Mendoza were/are my icons. After almost 24 years of marriage, when my parents finally split, the first thing she did was learn to drive. At 40 years-old my mom was living it up like never before. Can you blame her after all that? Gloria has spent the last 20-plus years living life more fully -traveling, living on her own, buying a home, becoming semi-retired and driving around her neighborhood whenever she feels like it. My mom Gloria always knew what was up and became the driver of her own life eventually. I love your story, I love you! Thank you for sharing this inspiring part of you with us, it is quite understandable where you got your beauty from your strength. I have always admired you.